Happy springtime! The odds are good that Nome will see a day or two above +60 degrees during May, although by the start of June, the normal daily high temperature is only +48 degrees, and we often see several inches of new snow. This is the month of the melt, converting Nome�s dirt streets to goopy, pudding-like mud. It�s a time for high rubber boots. You can imagine that it�s not our prettiest season! Of course, we do enjoy the new warmth and the promise of an Arctic summer. As spring approaches our remote corner of the globe, please accept our most sincere thanks for your prayers and financial help. It is you who keeps us on the air, beaming strong throughout this vast region. Thank you! top EASTER SUNDAY: With the temperature above zero, Nome�s weather was just fine for tiny Easter egg hunters, but at suppertime the wind rose, snow began to fall, and Nome was in the middle of a suppertime blizzard (left), dropping visibilities below a sixteenth-mile. In the photo, Tom and Florence Busch�s daughter Kate fights the 30 MPH wind a block north of the KNOM studio. 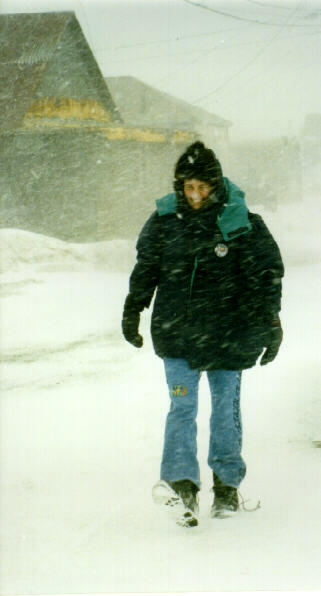 The storm didn�t affect most folks, though it drifted some area roads a foot or two deep. However, from three miles out of town at the remote KNOM transmitter, alarms began to ring all over the place. The wind was a furious gale on the open tundra, and it pinned the building�s ventilation shutters closed, forcing waste heat from our 25,000 Watt transmitter back into the building. By the time Les Brown, Paul Korchin and Michael Warren reached the site in a caravan of 4-wheel-drive vehicles the temperature in the building had risen to a frightening +98 degrees! Les propped the shutters open, and the three drove back to the safety of town as the storm began to intensify, just in time for Easter dinner dessert. The oldest Catholic radio station in the U.S., award-winning KNOM beams inspiration, education and companionship throughout Arctic Alaska, and deep into the Russian Far East, too. Our only source of operating revenue is you. Thank you for your generous helping hand. INSPIRATIONAL SPOT: God does not love us because we�re valuable. We�re valuable because God loves us. 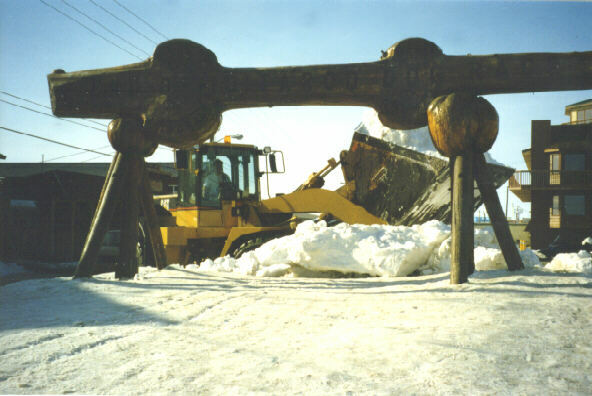 top MONUMENTAL LOSS (left): We believe this is the last photo ever taken of the historic end-of-the-trail Iditarod monument, snapped by Tom Busch as workers prepared to move it off the street to its summer home alongside Nome City Hall. Minutes later, the forklift carrying the wooden landmark faltered, and the huge burled log split off its mount and tore apart, (left), the victim of dry rot. 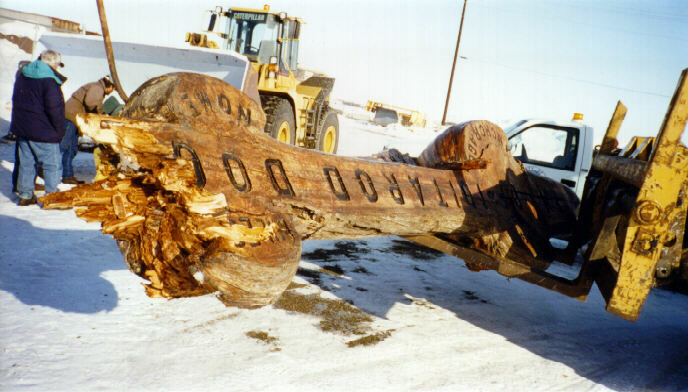 The �arch,� as it was known, was deemed unrepairable, and various fans of the trail are working to find a similarly unique spruce log for a replacement. 32 YEARS AGO: With the coming of spring in May 1967, Nome�s snow level dropped from rooftop height to only about eight feet above the ground. LOTS OF SENATORS! When the Post Office in Nome held a second day of issue stamp ceremony in Nome, the town hosted not only U.S. Postmaster General William Henderson, but also three U.S. Senators: Ted Stevens of Alaska, Colorado�s Ben Nighthorse Campbell, and Mitch McConnell of Kentucky. It was the first time in memory that Nome has seen three U.S. Senators. The stamps feature an Arctic fox, a polar bear, an Arctic hare, a gray wolf and a snowy owl. INSPIRATIONAL SPOT: Life is a coin. You can spend it any way you wish, but you can only spend it once. top UNDER-MUSCLED! 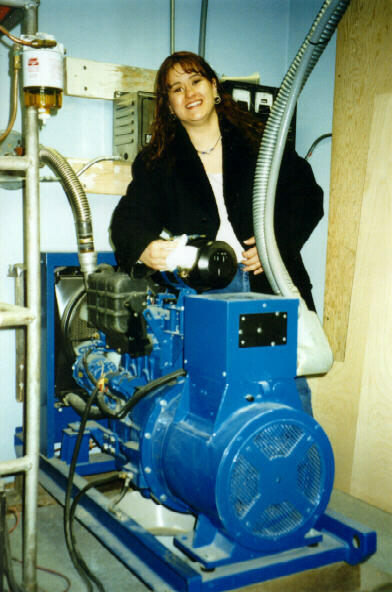 Volunteer Vicki Muzik has plenty of elbow grease to dust the studio�s emergency generator. It�s the generator that lacks oomph. The 12,000 Watt rig fit our needs when we installed it in 1993. Since then, we�ve grown. Today, the generator is not quite hefty enough to meet our electrical load. Further, we�ve uncovered a problem that has been recognized only recently in other remote locations by outfits like Arco Petroleum. It centers on the �uninterruptable� battery power supplies that keep computers running and secure during power brownouts and outages. These power supplies do not like electricity produced by small, diesel generators. In fact, they can cause the computers to shut down, sometimes catastrophically. Experts who are starting to deal with this problem in other locations have advised us to use a much larger generator. Simply stated, our studio needs a bigger generator if we are to remain on the air for long periods of time during power outages. There�s good news. As you can see, our little 6-year-old generator is in mint condition, and several prospective buyers are lined up to take it off our hands for $5,000. us to tackle this much needed project. It would cost $2,000 more to replace our rusting fuel tank with a safe double-wall tank, and for an additional $8,000 we could protect the volunteer house with emergency power, too. Nome is overdue for a storm that would wipe out city power for days. Can you help? INSPIRATIONAL SPOT: The teacher asked the pupils to tell the meaning of loving kindness. top About 300 people log onto KNOM�s WEB SITE every week. Once there, they read �Nome Static� newsletters from the past, check out biographies of the staff, and view over one hundred historic pictures. You�ll find us at www.knom.org. If you�re not a web �surfer,� you might have a friend, or a neice or nephew or a grandchild who is. Many public libraries offer free access to the Internet, and their staffs are usually happy to help. BIG BOOST: Preparing for our gigantic antenna booster giveaway in May, we�ve stockpiled the first 180 boosters, most of which will be distributed in our most distant villages. This project, which represents about 4% of one annual budget, may increase permanent listenership by 10% or more. Thank you to everyone who has made this fantastic undertaking possible! WE GOT THE DRIFT! In mid-April, Les Brown checks the ropes that form part of the fence around the remote KNOM tower. Brutal winds sculpt the snow into hard-packed drifts as tough as cinder blocks that often rise to the height of the 8-foot pickets. The ropes increase the protection of the fence to about 13 feet above ground. The picket fence �works� from about May through February, but in the late winter, snow often drifts completely over it. We�ve experimented with ten-foot pickets, with the result that the snow drifts ten feet, and we believe that twelve-foot pickets would produce twelve-foot drifts. top LOTS OF SPOTS: 14,000 inspirational spots aired so far this year, and 14,000 educational ones, thanks to you! NOTHING FISHY: And that�s the problem. In an historic 3-day meeting heard live over KNOM, the Alaska Board of Fish voted to severely restrict subsistence chum salmon fishing in the Nome area. Historically, hundreds of families have caught hundreds of fish each. This year, only the neediest 20 families will be allowed 100 fish each. As you can imagine, the decision was very controversial, and the lack of fish continues to be a subject of lively discussion. OUR PLEDGE TO YOU: Out of respect for our benefactors, we renew our pledge, continuous since 1966, that we will never provide your name and address to anyone. INSPIRATIONAL SPOT: Do not adorn yourselves outwardly by braiding your hair, and by wearing gold ornaments or fine clothing; rather, let your adornment be the inner self with the lasting beauty of a gentle and quiet spirit, which is very precious in God�s sight. top Please pray for the soul of Michael Rizzone, won�t you? Mike was a KNOM volunteer in 1974. He died following a short illness at the age of 54. And please pray for us and our work, and for our listeners, too. We begin each weekly staff meeting with a prayer for you, and many of us keep you in our daily prayers, too. Again, thank you and may God bless you!